What is a Madrid Hack? Hi Madlocals! I’ve been asked several times what would I highlight or recommend for people that come to Madrid just to stay for a long weekend. As you may know, the city is plenty of things to do, monuments to visit and restaurants to have lunch, so when somebody asks me what to visit in just 36 hours, answering can be a difficult task. 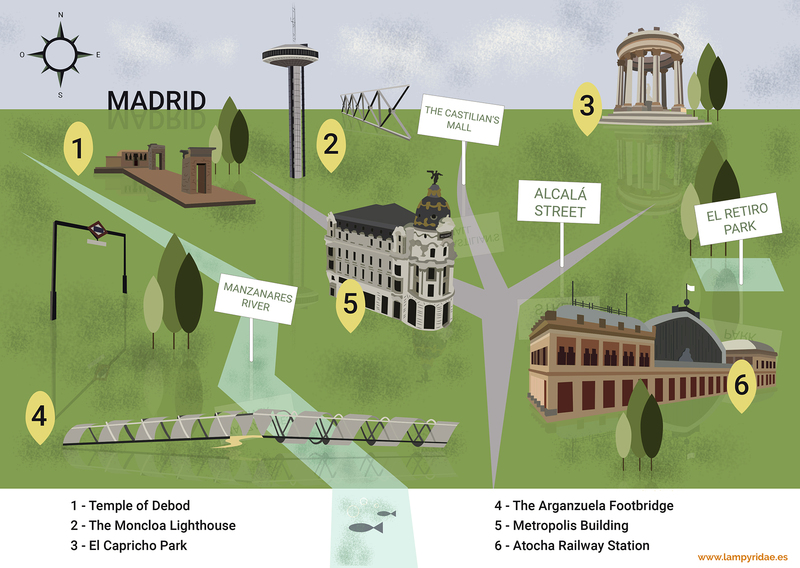 Luckily enough, today I have something special for you: my friends from Lampyridae Comunicación have designed the wonderful map above with some of my top picks for spending a very special weekend in Madrid. The people of Lampyridae Comunicación are also Madlocals, as they lived in Madrid for some years and thus know very well every corner of this city. They have chosen a perfect mix of mainstream places and hidden ones – or #madridhacks, as I like to call them. Taking on account distances, I’ve designed a 36-hour schedule. You can use it literally, or as a compass or simply a list to pick ideas for your stay in Madrid. Let’s assume you have arrived the night before and you have had some time to sleep, or at least try to recover from your jet lag. You can start your day at Plaza de España, at the very heart of Madrid: it’s a large square between Gran Vía (Madrid’s mainstreet) and Calle de la Princesa, also an important commercial street plenty of shops and some spectacular buildings. You’ll can admire the España Building, a magnificent skyscraper built after the Spanish Civil War originally as a demonstration of General Franco’s Administration power, that well soon became an architecture icon for its symmetry and its neo baroque style. There are plenty of cafeterias around this place, but I suggest having breakfast at Faborit if you want to start your day with an organic, healthy touch. Do you know there’s an Egypcian temple in Madrid? That’s Temple of Debod, spot number 1 in Lampyridae’s map. It’s only 7 minutes walking (checked with Google Maps) away from Plaza de España. This temple is about 2200 years old and was a gift from Egypt to Spain for its collaboration to protect Abu Simbel complex during the sixties. There are free visits available from Tuesdays to Sundays (including Bank Holidays), from 10am to 20pm. #MadridHack Temple of Debod is placed in a park that has another extra for visitors: look for its wonderful viewpoint, where you can have wonderful views from the Royal Palace. Once you’re done with this, you can head to Ferraz Street to take a walk and admire its 19th Century Buildings. You can also wander around and end up at Princesa Street again. This street ends with three interesting spots: an impressive Arm Forces building, the West Park, a triumphal ark and, in front of it, map’s spot number 2: the Moncloa Lighthouse. This is a perfect place for having a 360º view of Madrid’s skyline. Check this video to know more. Moncloa Lighthouse’s tickets are just 3 euros per person. It’s opened from Monday to Sunday, from 9:30 to 20:00. Follow this link for more information. After visiting this spot, you may feel hungry. Good news: Moncloa’s neighbourhood is plenty of good restaurants! If you want to have some nice, Spanish food, I suggest El 62 de Cea (C/ Cea Bermúdez, 62), Nájera (C/ Guzmán el Bueno, 55) or Alcaravea (C/ Gaztambide, 56). If you want to completely enjoy Madrid as a local, I suggest a plus for eating: go to Mercado de Vallehermoso (an old, charming street market) and try some organic food made with local ingredients. My favorite place is Kitchen 154, but I’m afraid they cook oriental, spicy food. If you are in the mood for that, please book in advance. Spot 3 at the map is also a #MadridHack, and I’m sure you are going to love it. It’s Capricho Park, once a Dutchess’ private gardens and know a huge park plenty of curiosities. I’ve already talked about it in this post. After a wonderful day, I suggest to end your Madlocal experience with another #MadridHack, Calle Ponzano. Take Line 7 at the Metro from El Capricho and drop off at Alonso Cano’s stop. Then look for Ponzano Street: almost 90% of this street is made out of pubs, restaurants and tapas bars. I suggest to follow your gut and pick whatever you like, with if you want some guidance, here are some names: La Máquina de Chamberí, Picsa, Alipio Ramos, Vagalume, La Contraseña, Sala de Despiece. I suggest start Day 2 with a nice breakfast or brunch at Federal Cafe. This place is very sensitive with allergies and has lots of vegan options, plus everything is yummy! Then you can skip for the moment spot 4 and go to spot number five: Gran Vía. This place is the heart of Madrid: walk the street, admire buildings and characters, go shopping (BTW, the biggest Primark store in Europe is here!!) and explore the surroundings: Puerta del Sol, the Royal Palace, the Opera House, Cibeles Fountain or Correos Palace are good examples of what you can find, including our Madlocal’s logo: Metropolis Building. You can also approach Puerta de Alcalá and then go to take a walk over the Retiro Park. You can admire its crystal palace or hire a boat at the famous Retiro’s pond. #MadridHack Do you know the only estatue ever erected to honour the Devil is in Madrid? Well yeah, it’s placed in the Retiro, and its proper name is the Fallen Angel Statue. It’s quite poetic until you spot the little demons placed in its basement. For having lunch, near Retiro I suggest Café Murillo. If you want something more Spanish, then take a walk and try at El Paraguas, Ten Con Ten or La Maruca. After enjoining a wonderful lunch, you are more than ready to visit one of the museums placed at the Art Triangle: Museo del Prado, Museo Reina Sofía and Museo Thyssen-Bornemisza. Check the Low cost plans in Madrid post for some interesting info. Let’s assume your flight is taking off at the evening. Given that the airport is very close to the city, as I wrote in this post, you can have the whole morning for doing some plans! Spot number 4 should be perfect for you: hire a bike and enjoy Manzanares River Walk, with beautiful bridges as the Arganzuela Footbridge. You can start from Príncipe Pío Station and end at the Matadero (old slaughterhouse, now a cultural center) or either way, both are interesting and worth visiting! Hope you’ve found this post useful. Thanks again to Lampyridae Studio for this wonderful map. And, until the next post, let’s enjoy Madrid as Locals!